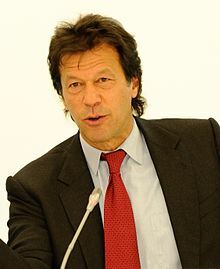 Imran Khan declares victory in Pakistan election – Royal Times of Nigeria. Former cricket star Imran Khan declared victory on Thursday in Pakistan’s general election, as a partial count gave him a big lead but final results were delayed and opponents alleged vote rigging. “This will be the first government that will not carry out any political victimization,” Khan said in a speech on Thursday. Supporters of jailed ex-premier Nawaz Sharif said there were problems with the vote count and the process was an assault on democracy in a country that has a history of military rule. 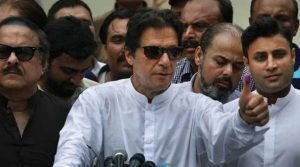 With nearly half the votes counted from Wednesday’s election, Khan’s Pakistan Tehreek-i-Insaf (PTI), or Pakistan Movement for Justice, was in a commanding lead in the nuclear-armed, Muslim nation. But supporters of jailed Prime Minister Nawaz Sharif said the counting process was an assault on democracy in a country that has a history of military rule. The stock market shot up nearly two per cent in early trading on relief the likely coalition government will not be a weak one. Pakistan faces a mounting economic crisis that is likely to require a bailout by the International Monetary Fund, although PTI has not ruled out seeking succor from China, Islamabad’s closest ally. Election Commission of Pakistan (ECP) secretary Babar Yaqoob said told reporters early on Thursday counting had been delayed by technical failures in an electronic reporting system and the tallying was now being conducted manually. The results had been due by 2 a.m. (2100 GMT on Wednesday). Chief Election Commissioner Sardar Raza also defended the process, saying “elections were 100 percent transparent and fair”, but could not set an exact deadline when the full results would be released. Sharif’s Pakistan Muslim League-Nawaz (PML-N) was ahead in 64 constituencies, and the Pakistan Peoples Party (PPP), led by the son of assassinated two-time prime minister Benazir Bhutto, led in 42 constituencies. Although Khan still appeared likely to fall short of the 137 seats needed for a majority in the National Assembly, he should not have problems finding coalition partners from smaller parties and independents. Pakistan’s benchmark 100-share index, surged as much as 1.9 percent to 42,136 points in early trading. Analysts said investors were relieved Khan is now unlikely to have to rely on major opposition parties in a messy coalition. “Now they can go ahead with smaller allies and make necessary reforms without much opposition,” said Saad Hashemy, local brokerage Topline Securities’ director of research. This election will mark only the second civilian transfer of power in Pakistan’s 71-year history, and comes at a time when relations with on-off ally the United States are volatile. The PML-N, which came to power in a landslide 2013 vote, had sought to cast the election as a referendum on democracy, saying it was campaigning to protect the “sanctity of the vote”, a reference to a history of political interference by the military. Early on Thursday, Sharif’s brother Shehbaz, who now leads the PML-N, rejected the results after complaints that soldiers stationed in polling stations had thrown out poll monitors from political parties during the counting. “This is the warning bell of a serious threat,” said PPP senator Sherry Rehman.